Lynne Reich on Igor Gouzenko's place at 511 Somerset Street . . . 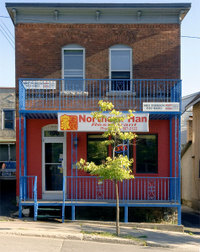 The Northern Han restaurant at 870 Somerset. You can contribute to this blog by leaving comments about the places you see here. The pictures seen here are from a large body of work that I have been working on since 1999. I have photographed almost every building on Somerset Street between Bank Street and Wellington Street. My personal connection with the street is straightforward - I lived in the neighbourhood for a few years, knocked on a lot of doors as an enumerator for two elections and I still live nearby, buy groceries here and eat in the restaurants on the street. This part of Ottawa fascinates me as architecture, culture and historical process. The more I have looked at the street with a camera the richer it has appeared to me as a metaphor for Ottawa's and a Canadian experience. During the last 40 years it has been "colonized" by diverse groups of new Canadians. This place has somehow escaped the urban renewal/city planning steamrollers that cut down other mature neighbourhoods and replaced them with the new. Perhaps the street evaded development because it is too geographically extended or ethnically diverse or maybe it was just not valuable enough to be a good candidate for investment? I don't know. Sadly, the biggest engine of change on the street at the moment seems to be fire. I have really enjoyed watching how the street's aging and eclectic mix of vernacular commercial architecture, older apartment blocks and re-purposed homes have evolved and been changed by the people who use it. There is an unstructured and chaotic aspect to this street and I believe that this organic nature keeps it contemporary and relevant to the communities who use it. As a photographer I have also enjoyed the simple pleasure of learning about this place by using my eyes.This project has been as a way to re-connect myself to a documentary process of working with cameras as a matter of fact that I have not engaged in for a long time. Although this project visually emphasizes the buildings, people appear in many of the images. These people are un-named as a practical matter but they are not being trivialized in the process. They have left marks and traces everywhere I look. The people and the street need each other. A selection of about 50 prints will be displayed as a solo exhibition at the Bytown Museum in Ottawa until November 2009 . The gallery installation includes an internet connection so that visitors can access this blog and contribute their comments and anecdotes to this online archive . You can see how the exhibition is installed by clicking here. Everyone's input is valued. Project 4000 was the initiative that brought so many refugees and victims of war and economic turmoil here to Ottawa. Read more about this in The Ottawa Citizen here and also from the Vietnamese Canadian Federation at this link. This link leads to the official site for the museum. The Third floor of this house appears to be older and to indicate the original nature of the house. The brickwork on the front is probably quite a bit more recent. Lovely day for a walk on the street. This mural is on the north side of the street where Cambridge street intersects. It is a commission sponsored by the Somerset Street Business Improvement Association (BIA) and the Ottawa Police that was made by Cairn Cunnane. This fire occurred on October 16 2007. Several businesses were lost and at least 10 rooms. The site this new building is on sat vacant for a very long time. There is another post showing the lot and a billboard as well as an interior from the Vendome Hotel which once existed here before it burned. Go here to see those pictures. A large vehicle crashed into the corner of this building many years ago killing a man who was seated there. How sad. This building is on the southeast corner at the intersection of Lyon across from Dundonald park.